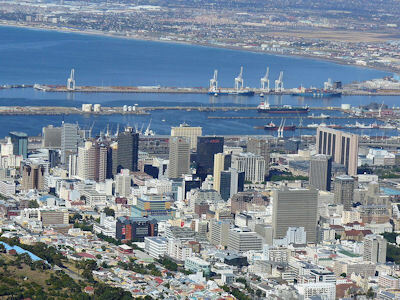 For comparability with other large cities around the world, Cape Town has been defined as the Cape Peninsula together with the northern suburbs from Bloubergstrand in the west to Durbanville and Kraaifontein in the east, the built-up areas of the Cape Flats and the Eersterivier-Somerset West area. This metropolitan region comprises the entire urban and semi-urban area administered by the recently enlarged City of Cape Town, excluding the predominantly rural areas in the far north such as Atlantis and Mamre. Of the names of the 882 suburbs and neighbourhoods that have been identified to date in Greater Cape Town, 115 (13.0%) can be found in Scotland or are based on Scottish family names or Scottish words. Of course, some of the names are used in other parts of the British Isles as well, but at least 60 of these (6.8%) appear to have a direct or indirect connection with Scotland. However, several of these names are variations on a single name, for example the numerous suburbs with Brackenfell as part of their name or made-up names based on Bellville. The photo of central Cape Town is via Wikimedia. Airlie (Aberdeenshire and Angus). This small suburb in the Constantia area was presumably named for one of the Scottish villages. Balvenie (Moray). 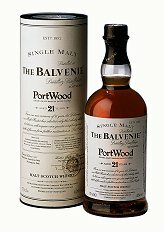 Balvenie gave its name to a well-known malt whisky - see illustration. This suburb, in the Elsies River area, presumably takes its name from Balvenie Avenue. Bellville, Bellville Park and Bellville South - these suburbs were named after Charles Davidson Bell, Surveyor-General of the Cape from 1848 to 1872. The following account of Bell was given in the Friends of the Michaelis Collection, Past Newsletter 29, September 2000: "Charles Davidson Bell (1813-1882) arrived from Scotland in 1833 and rose to become the Cape's Surveyor-General 1848-72. Bell was a prolific artist in many mediums. His best-known painting is 'The Landing of Jan van Riebeeck', but he also became famous for his design of the Cape triangular postage stamp." Belrail and Bosbell - The names of these suburbs owe their origin indirectly to Charles Davidson Bell (see Bellville above). In the case of Belrail, the name reflects the practice of the colonial and Union railway authorities of naming railway property after the suburb near which it is located together with the word 'rail' (see Humerail in the Rampant Scotland article on Port Elizabeth as another example involving a Scottish surname). Bosbell appears to be a name that was made up from two adjoining suburbs, Boston and Bellville. Bonnie Brae - there is a bed and breakfast establishment in Helensburgh, Argyll & Bute, called Bonnie Brae. The name means 'pleasant hill' in Scots. Bonnie Brae, located to the north of Bonnie Brook in the Kraaifontein area, is one of Cape Town's newest suburbs. Bonnie Brook - this appears to be a made-up name combining the Scots 'bonnie' (pleasant-looking) and the English 'brook' (a small stream). All the streets in this suburb are named after rivers in Southern Africa. Brackenfell, Brackenfell Industrial, Brackenfell North, Brackenfell South and Bracken Heights - According to Raper (1989), these suburbs were named after the farm Brackenfell, which George Henry Walton bought in 1901 and "named thus because he was reminded of Scotland." Further information on the early history of the suburb is provided in the South African History Online website: "In 1901 Andries Brink sold a portion of his farm Kruispad to George Henry Walton, a Scottish immigrant, who named his purchase Brackenfell in honour of his homeland. In 1903 Walton sold the property to the Brackenfell Estate Granite and Brick Company who developed it as a granite quarry. On 15 March 1904 a railway siding was built at Brackenfell to service the Company's transport needs." ( South African History Online ). Braeview - there are numerous roads and streets in Scottish towns and cities called Braeview, as well as guest houses and other establishments. The Cape Town suburb is located in the Somerset West area. Clunie (Aberdeenshire and Perth & Kinross). This small suburb, like Airlie (see above), is located in the Constantia area. One wonders, therefore, whether the names of both suburbs have a connection with Aberdeenshire. Crawford (South Lanarkshire; also Crawfordton, Crawfordton Burn and Crawfordton Hill (Dumfries & Galloway), Crawford Hill (East Ayrshire), Crawforddyke and Crawfordjohn (South Lanarkshire) and Crawfordston (South Ayrshire). There are also a few places in northern England and Northern Ireland with Crawford as part of the name, probably having been taken there by Scottish settlers. 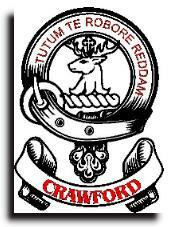 Crawford (sometimes spelt Crauford) is a Lowland Scottish name. The illustration shows the Crawford family crest. The name goes back to at least the 13th Century. 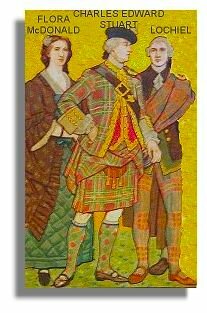 William Wallace's mother is believed to have been the daughter of Sir Hugh Crawford, Sheriff of Ayr. It is interesting to note that most of the streets in Crawford have an Australian theme, with many being named for main roads in Melbourne's inner suburbs, including the Scottish names Glenferrie and St Kilda. For the record, the other streets in Crawford that clearly recall Melbourne are Burnley Road, Burwood Road, Camberwell Road, Melbourne Road, Riversdale Road and possibly Taronga Road (Tooronga Road in Melbourne). Crofters Valley - this name does not occur in Scotland or other parts of the British Isles but it has a Scottish connotation. The Collins Gem Scots Dictionary defines a croft as "a small enclosed plot of land, adjoining a house, worked by the occupier and his family." Crofter is a term that originated in the 18th Century and is generally restricted to the Highlands of Scotland but has been applied to similar land occupancy in the west of Ireland as well. 'Croft' also occurs widely as an element in English place names, in the sense of a small enclosure but the term 'crofter' is rarely used to describe land occupancy in England. Dunoon (Argyll & Bute). The name of this Cape Town suburb is often spelled Du Noon, however, which raises a question mark as to whether its origin is truly Scottish. The illustration is of the town Dunoon in Argyll & Bute. Dunrobin (Dunrobin Castle, Glen, Head and Wood in Highland). Dunrobin Castle is the home of the Duke of Sutherland. The suburb of Dunrobin (one of Cape Town's smallest suburbs, located in Bellville) has only one street which, interestingly enough has a Scottish name - Baxter. Durbell - As in the case of Bosbell (see above), the name of this suburb is partly attributable to Charles Davidson Bell, being made up from the names of the adjoining suburbs (former municipalities in their own right) of Durbanville and Bellville. Faerie Knowe - there is a broch (an Iron Age stone tower) in Stirlingshire called Fairy Knowe and a bed-and-breakfast establishment in Aberlour called Fairy Knowe House. 'Knowe' is the Scots form of the English word 'knoll' (a small, rounded hill). The Cape Town suburb is located in the Fish Hoek area and is sometimes spelled Fairy Knowe. Ferness (Moray). The Cape Town suburb is located in the Ottery area. Many of the streets are named after trees and bushes. Forbes Lincoln - there is a Forbes Villa and Forbestown in Aberdeenshire and a Forbes Place in Inverclyde. Forbes is an old Scottish family name, adopted from a place name in Aberdeenshire - that's the Dress Forbes tartan shown here. The Lincoln part of the name would have an English derivation, e.g. the cathedral city in Lincolnshire. Forbes Lincoln is a small suburb on the Cape Flats and adjoins another small suburb which has a Scottish name - Lochiel (see entry below). Glen Alpine - this name has a Scottish ring to it (e.g., Kenneth MacAlpin, who united the Picts and Scots) but is not found as an actual place name in Scotland. The name sounds equally Manx (there is a place called Alpine on the Isle of Man), while a reference to the European Alps is also a possibility. No information has been found on the reason for the name of this suburb in the Constantia area. There is nevertheless the distinct possibility of a Scottish connection. According to Scarlett (1975, p. 86), the term Alpine "is generally taken to mean a group of clans all claiming descent from Kenneth MacAlpin…." Glenhaven - this Bellville suburb appears to take its name from Glenhaven Avenue. Several other streets in the suburb also have Scottish sounding names (Glen, Glencarol, Glendale and Glenco). Glen Marine and Glen Ridge - since these suburbs are immediately adjacent to Glencairn, it is a reasonable assumption that their names were inspired, in part, by that of Glencairn itself. Gordon's Bay (Gordon in the Scottish Borders as well as many other places throughout Scotland with Gordon as part of the name, e.g. Gordonstoun, Gordonstown and Gordonsburgh). Gordon is also the name of a place on the Isle of Man, probably having been taken there by Scottish settlers. This coastal resort, which was recently absorbed into Greater Cape Town, was named after Colonel Robert Jacob Gordon (1743-1795) who arrived at the Cape in 1777 and who later took charge of the garrison. Colonel Gordon, a Dutchman, was the second son of Major General Jacob Gordon of the Scottish Regiment (of the Dutch army) and a Dutch mother, Johanna Maria Heydenrijk (MacKenzie, 2007, p. 30). Colonel Gordon's Scottish ancestors presumably resided in Clan Gordon territory in Aberdeenshire before settling in the Netherlands. The illustration shows the crest of the famous Gordon Highlanders, a British army infantry regiment from 1794 to 1994, which drew its recruits mainly from the north-east of Scotland around Aberdeen. Grahamdale - there are many places in central and southern Scotland beginning with Graham from the surname, including the village of Grahamston in Falkirk. There are also two places just over the border in Northumberland (Graham's Cleugh) and Cumbria (Graham's Onset) but Graham is definitely an ancient Scottish name of Anglo-Norman origin, derived from Old English graeham (greyhome). The most famous bearer of the name was the brilliant soldier James Graham, the 1st Marquess of Montrose (1612-50). Of course, it is possible that the name of the suburb in the Bellville area of Cape Town may refer to a Christian name, which could reduce the likelihood of a link with Scotland. Green Point (Shetland Islands). Known to the Portuguese as Ponta da Praia ('beach end' or 'beachpoint'), it was named Green Point in 1675, "making it the second oldest English place name in South Africa (Chapman's Peak is said to be the oldest)." (Raper, 1989). Although the name occurs only in Scotland, and not elsewhere in the British Isles, it is unlikely to be of Scottish origin and more likely to be a purely descriptive name. Highlands Estate - a reference, perhaps, to the Highlands of Scotland. This is an unusual name to give to an estate situated on the low-lying Cape Flats. Hume - there is a Hume in the Scottish Borders, as well as Humehall, Hume Castle, Hume Craigs, Hume Mill and Hume Orchard; also Humesett and Humeston in Ayrshire. Hume is also a Scottish family name. The Cape Town suburb is located in the Bellville area. Laurindale - Laurin is a reduced form of the Scottish surnames of MacLaren or MacLaurin. There is an equestrian centre called Laurindale Stables in Alberta, Canada (a part of Canada which has many Scottish place names). Cape Town's Laurindale is a fairly new suburb located in the Bellville area. Lochiel - the name of this suburb no doubt recalls the legendary historical figure of Sir Ewen Cameron of Lochiel (1629-1719), described by Macaulay as the "Ulysses of the Highlands" and who features in Sir Walter Scott's romance "Lady of the Lake". Sir Ewen's grandson Donald was known as "the gentle Lochiel" and is regarded as one of the noblest of all the Highland chiefs. He was persuaded, through loyalty to the crown and the persuasive words of Prince Charles Edward Stewart, to support the 1745 Jacobite Uprising. It is said that if Cameron of Lochiel had not agreed to participate, the rising might never have got off the ground, such was his influence. In the Scottish National Portrait Gallery in Edinburgh his likeness stands beside Bonnie Prince Charlie (see illustration). Maitland and Maitland Garden Village - there is a place called Maitland in South Ayrshire. According to Laidler (1952) these suburbs were named for Sir Peregrine Maitland, Governor of the Cape between 1844 and 1847. Prior to his appointment at the Cape, Sir Peregrine had served with distinction at the Battle of Waterloo, was made Lieutenant-Governor of Upper Canada in 1818, Lieutenant-Governor of Nova Scotia (1828-1834) and Commander-in-Chief of the Madras Army in India (1836-1838). Maitland is a Lowland Scottish family name. Sir Peregrine was born at Longparish Hall in Hampshire, England and died in London. 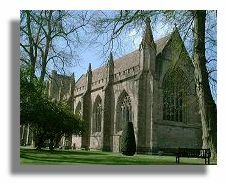 Whilst the connection is therefore English in the first instance, Maitland is nevertheless a Scottish family name. Morningside - there are several places in Scotland called Morningside (in Dumfries & Galloway, North Lanarkshire, Perth & Kinross and, most famously, in the City of Edinburgh). Morningside is one of the most commonly recurring Scottish place names in cities around the world, especially in South Africa and the USA. The name of the Cape Town suburb is aptly chosen as the suburb is located on the eastern (or 'morning') side of Somerset West. Murdoch Valley - there is a Murdoch Head in Aberdeenshire and Murdochcairnie in Fife. Murdoch is a Scottish family name, associated with Clans MacDonald and MacPherson. Rosebank (Angus, Scottish Borders, City of Edinburgh, Dumfries & Galloway, East Dunbartonshire, Fife, Highland, Moray, Orkney Islands, South Lanarkshire and West Lothian). The name also occurs in Devon, England but is far more Scottish than English. Russels Rest- there is a place in Highland called Russel. Russel is probably an alternative spelling of Russell, a Scottish (and English) name of Norman origin. Schotsche Kloof - Nestled in a nook at the foot of Signal Hill to the immediate west of the CBD, adjacent to the colourful 'Malay Quarter' (now known as Bo-Kaap), this is a very old suburb by South African standards. The name means "Scottish ravine" in Cape Dutch and according to Laidler (1952) the suburb was originally a farmstead. On an early British map of Cape Town, soon after the second and final British occupation of the Cape in 1806, the farm was recorded as "Scotch Kloof" and was one of only a handful of vaguely "English" looking names on the entire map, surrounded by Dutch names. Scott Estate, Scottsdale, Scottsdene and Scottsville - the names of these suburbs are not necessarily Scottish. According to Black (1996), the authority on Scottish family names, there are more people with this Border Scottish surname in Northumberland than in the whole of Scotland. There are several places in England with Scott as part of the name. Scottsdale, for instance, is the name of a place in Somerset. The surname 'Scott' (whose family tartan is shown here) has nevertheless consistently appeared among the top 9 to 13 most numerous family names in four surveys conducted in Scotland between 1858 and 1976. Surveys in England, on the other hand, place Scott in roughly the 40th position, though their numbers would exceed those in Scotland by virtue of the size of England's population relative to that of Scotland. Seaforth (Western Isles). It is very likely that the name of this coastal suburb near Simonstown on False Bay refers to the Seaforth Highlanders (that's their crest shown here) who landed in the area in 1795 under the command of Commodore Elphinstone and Major-General Craig. Simonstown was captured from the Dutch, with Cape Town itself being taken into 'protective custody' a few weeks later, in a move to prevent the Cape from falling under French control. Alternatively, the suburb may have been named for Seaforth in Liverpool, in which event its origin would still be Scottish since the Merseyside suburb was named for Seaforth House, the home of the Scottish merchant Sir John Gladstone (1764-1851), who was the father of Prime Minister W.E. Gladstone. Shady Glen - The name of this Somerset West suburb has a distinct Scottish ring to it, for example as in the third verse of the well-known Scottish folksong 'The Bonnie Banks o' Loch Lomond': 'Twas then that we parted in yon shady glen, On the steep, steep side o' Ben Lomond, Where in purple hue the hielan hills we view, And the moon comin' out in the gloamin'. It is possible, of course, that the suburb was named for purely descriptive and/or marketing reasons, with no intended reference to the Scottish folk song. Silversands - there is a Silversands Bay in Fife to the east of Aberdour on the Firth of Forth. The name of the Kuilsrivier suburb may well have been chosen without any intended reference to its Scottish namesake. St Kilda (Western Isles). According to the Penguin Dictionary of British Place Names (2003) the name of this remote island derives from an Old Norse word 'skildar' meaning 'shields', creating a bogus 'saint' in the process of its anglicisation. Steel Park (East Ayrshire, spelt Steelpark). It is possible, of course, that the name of the Bellville suburb is purely descriptive of its industrial location. Stuart's Hill - Stuart is a Scottish family name; there is a Stuartfield in Aberdeenshire based on this name. Stuart is one of the most distinguished Scottish family names because of its association with royalty. The House of Stuart (or Stewart) reigned in Scotland for three and a half centuries (from 1371 to 1714) and for a hundred years in England between 1603 and 1714. Information on the individual whose name was given to the Somerset West suburb is not available. 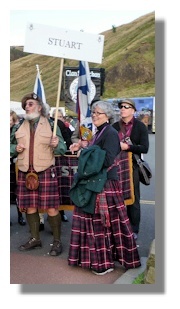 The picture here is of the Stuart clan representatives at the clan gathering in Edinburgh in 2009. Sunset Links Residential Estate - 'links' is a Scots word meaning 'undulating, sandy ground near a shore' or a golf course on such land. This suburb is located on the northern side of the Milnerton Golf Course. See also The Links below. The Glen (Aberdeenshire, Scottish Borders, East Lothian, North Ayrshire and Western Isles). The name also occurs in Cumbria, Northumberland and West Yorkshire however. Glen is, of course, a Scots word, derived from the Gaelic 'gleann' meaning 'valley'. Since this locality is located in the Glencairn area (see Glencairn above), it is a reasonable assumption that the name has a Scottish origin. The Links - 'links' is a Scots word meaning 'undulating, sandy ground near a shore' or a golf course on such land. This suburb is located on the northern side of the Somerset West Country Club Golf Course. See also Sunset Links Residential Estate above. Wallacedene - there are many places in Scotland based on the Scottish surname of Wallace, examples being Wallaceton in Dumfries & Galloway, Wallacetown in South Ayrshire and Wallacestone in Falkirk. One of Scotland's most famous Wallaces is Sir William Wallace, the 13th Century patriot who championed Scotland's independence when this was being threatened by King Edward I of England's expansionist policy. Wallace means 'Welshman', a Saxon term for 'foreigner' that was applied by the Saxons to the descendants of the Celtic-speaking Ancient Britons in Wales, Cornwall, Cumbria and Strathclyde. Austinville - there is an Austincroft in Highland but also Austin's Bridge in Devon, England. As a family name, Austin is more likely to be English than Scottish. Avon - there are several rivers in England, Scotland and Wales that are called Avon, a name which is of Celtic origin and which simply means 'river' (afon in Welsh; abhainn in Gaelic, both derived from Old Celtic abona). The Scottish Avons include a river in Falkirk, a tributary of the river Spey and a tributary of the river Clyde. The Cape Town suburb possibly takes its name from Avonwood Avenue, a main road in the Elsies River area. Avondale (Shetland Islands) also in England and Ireland. This suburb, in the Parow area, may have been named in honour of the Duke of Clarence and Avondale, eldest son of King Edward VII, in which event there would be a Scottish connection since Avondale is a Scottish title sometimes used by royalty. It is possible, however, that the suburb simply took its name from one of its streets, Avon Road. Belmont Park - Belmont is found in the Scottish Borders, Shetland Islands and South Ayrshire. It occurs even more frequently in England and is also found in Ireland and Wales. Belmont was an extremely popular choice of name in all English-speaking countries during the 19th Century. Its origin is ultimately French - 'beautiful mountain'. Blackheath (Highland) but more commonly used in England, perhaps the best known place being the London suburb. Browns Farm - there are numerous places in both Scotland and England that appear to be based on the family name of Brown. The surname Brown is very common in both countries, with surveys in the 1970s suggesting that it is the second most common family name in Scotland (after Smith) and the third most common in England (after Smith and Jones). Church Hill Estate (there is a mountain in Highland called Church Hill) but Church Hill is far more commonly found throughout England and to a lesser extent in Ireland and Wales. Clarks Township - there is a Clark Fell in Dumfries & Galloway, but Clark occurs more frequently as an element in English place names. Fairfield Estate (Fairfield in Clackmannanshire, Shetland Islands and Stirling) but found even more commonly throughout England and is also found in Ireland. Gill Cape - the element 'gill' occurs in several Scottish place names, including places simply called 'Gill' in Dumfries & Galloway, South Lanarkshire the Orkney Islands. The name occurs even more frequently in England, however, especially in the north. Glen Valley - there are places simply called Glen in Dumfries & Galloway, East Ayrshire, North Ayrshire, Orkney Islands and Shetland Islands, as well as two places in Ireland. In addition, there are hundreds of places in both Scotland and Ireland and a few in England and Wales with Glen as an element in the name. Glen means 'valley' in Gaelic. If the intention was indeed to give the suburb of Glen Valley a Scottish sounding name, then the result is clearly a tautology, analogous to the numerous places called Glendale in North American cities. 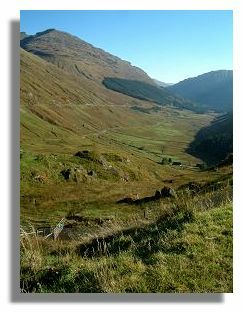 The "Glen" illustrated here is Glen Croe, seen from "Rest-and-be-Thankful" at the top of the glen. Glen View (Argyll & Bute, spelt Glenview) but there is a Glen View in Devon, England and also a luxury 4-star hotel in County Wicklow, Ireland called Glenview. Golden Acre - a district of Edinburgh is called Goldenacre. 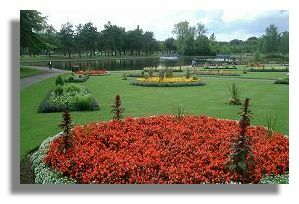 However, there is also a Golden Acre Park and Gardens in Leeds, Yorkshire. Hatton (Aberdeenshire, Angus, Fife, Moray, Perth & Kinross and Renfrewshire) but Hatton is also found in six English counties and Hatton Garden in London is famous as London's jewellery district. Hatton is also an English family name. Hazelwood Park - there is a village called Hazelwood in Moray, but the name occurs far more frequently in England, including the London suburb. Highgate (Dumfries & Galloway and North Ayrshire) but far more commonly found in both England and Wales. Kaymor - there is no trace of any place in Scotland with this name. Kay is nevertheless a Scottish family name, a sept of Clan Davidson. Mór is a Gaelic word meaning 'big' or 'great'. Kay is also an English family name, however, which suggests that the origin of the name of this suburb might not necessarily be Scottish. Kingston (Angus, East Lothian, City of Glasgow and Moray) also in England, Ireland and Wales. 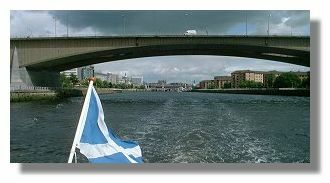 The illustration above is of the Kingston Bridge across the river Clyde in Glasgow. Mansfield (East Ayrshire, Fife, Inverclyde, Midlothian and Stirling) also in Nottinghamshire, England. One of Jane Austen's novels is called 'Mansfield Park'. Marlow (Orkney Islands) also in England. Millers Point - there is a Millerhill in Midlothian plus numerous other places in Scotland with Miller as an element in the name, but this is also the case in England. Northgate (Aberdeenshire) also in four English counties. The location of this suburb in the northern part of the city (Parow area) was most probably the reason for its name. Norwood (Dumfries & Galloway) although much more likely to have been named for the suburb in south London or other places in England, or even the suburb in Johannesburg. 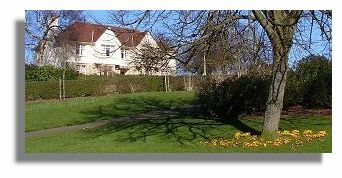 Primrose Park - there is a Primrose in Fife, but the name occurs more widely in England. Red Hill (Aberdeenshire) also all over England. Springfield (Argyll & Bute, Dumfries & Galloway, Fife, Highland and Perth & Kinross) also in England and Wales. Springfield is a very common name in the USA as well. St Vincent (Highland) also in Lincolnshire, England. Summerville (Dumfries & Galloway) also across the border in Northumberland. Townsend Acres and Townsend Estate (Townsend in Orkney Islands) but more common in England and is also found in Wales. Woodlands (Aberdeenshire, Argyll & Bute, Borders, Dumfries & Galloway, Fife, Highland, Perth & Kinross and South Lanarkshire) also all over England and is found in Ireland and Wales as well. There are two suburbs with this name in the City of Cape Town, one near Glencairn and the other in Mitchell's Plain. Woodstock (Orkney Islands) also in England and Wales. Originally called Papendorp, the name of this well-known suburb of Cape Town was changed during the 19th Century to the name of the local hotel. The origin of the hotel's name has not been recorded, but it is possible that it honours one of Sir Walter Scott's novels by that name (published in 1826) even though "Woodstock" was one of his less successful works. It is possible that another Cape Town suburb, Kenilworth, may also have been named for Sir Walter Scott's 'Kenilworth', published in 1821. Both Woodstock and Kenilworth are essentially English names, the setting for both novels being England (Woodstock in Oxfordshire and Kenilworth in Warwickshire). A final category of suburban names comprises places that can be found in Scotland but which, in Cape Town's case, definitely or most probably have no connection with Scotland. Belvedere (West Lothian) and Belvedere Noordhoek by association; Belvedere is also found in England, most famously in London, and there is also the well-known Belvedere Palace in Vienna, Austria. Belvedere was a popular choice of name for localities during the 18th and 19th Centuries. The Concise Oxford Dictionary defines a belvedere as a "raised turret to view scenery from" (a word formed from the Italian words for 'beautiful' and 'see'). The tiny suburb of Belvedere in the Parow area adjoins the suburb of Tafelsig ('view of Table [Mountain]'), which suggests a purely topographical reason for the name. Similarly, Belvedere Noordhoek, near Chapman's Peak, was probably named because of its panoramic vistas. Bishopscourt (Aberdeen City) also in England, Ireland and the Isle of Man. The Cape Town suburb derives its name from the residence of the Anglican Archbishop of Cape Town, which indicates a link with England rather than Scotland. Many of the streets and avenues in this suburb are named for British cathedral cities, the Scottish representatives being Dunkeld Avenue and Edinburgh Drive. 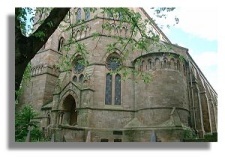 The illustration shows Dunkeld Cathedral in Perthshire. Claremont (Fife; also Claremont Gardens in Edinburgh) but places with Claremont as an element in the name are fairly common in England as well and County Clare in Ireland could be another source for the name. The Cape Town suburb most likely takes its name from Claremont House, the home of Sir John Molteno who became the first prime minister of the Cape. Molteno's house, in turn, might have been named after Claremont Estate in Surrey, England (one of Britain's royal homes), in which event there would be no connection with Scotland. Clifton (Scottish Borders, Orkney Islands and Stirling) but the name is used in many English counties as well, most famously the town of Clifton (now a suburb of Bristol) on the River Avon. According to the Clifton-on-Sea website the elite Atlantic seaboard suburb of Clifton was known originally as Schoenmakers Gat (Cobblers Cave) but was renamed Clifton-on-Sea around 1890 after Bessie Clifton, who ran the only hotel in the area. By the 1930s the suburb's name had been shortened to Clifton. As a family name, Clifton is more likely to be English than Scottish. Clifton is an apt name for the suburb, which literally clings to the steep cliff-face. Crossroads (Aberdeenshire, Fife and East Ayrshire). It is highly unlikely that this suburb near the airport was named for Scotland since it developed as a squatter camp around a major crossroads. Florida (Scottish Borders) but the name of this Cape Town suburb is more probably derived from America, or the Johannesburg suburb of the same name. The case for a link with the USA is strengthened by the fact that several other Cape Town suburbs have names that are definitely or most probably of American origin (Bay Park, Bernadino Heights, Brooklyn, Colorado, Malibu, Montana, Montclair, Monte Sereno, Monterey, Peerless Park, Sea Breeze, Sunkist and Washington Square). Frogmore Estate (Frogmore in Aberdeenshire) but Frogmore is a very common place name in southern England and is also found in Ireland. It is likely that the Simonstown suburb of Frogmore Estate takes its name from Frogmore Estate in Berkshire, England, which adjoins Windsor Castle and which contains Frogmore House, a royal retreat built by King George III for Queen Charlotte, and a royal mausoleum which contains the tombs of Queen Victoria and Prince Albert. Heathfield (Aberdeenshire, Dumfries & Galloway, Highland, Orkney Islands, Renfrewshire, South Ayrshire) also all over England and is found in Ireland as well. "So named because many varieties of heath were encountered there." (Raper, 1989, p. 204). Lotus River - there is a village called Lotus and a Lotus Hill in Dumfries & Galloway, the only occurrence of this name anywhere in the British Isles. The Cape Town suburb, however, no doubt takes its name from the canalised Big Lotus River on which it is situated. The river, in turn, may have been named in reference to lotus plants growing in the river's sandy soil. Mitchells Plain - there is a Mitchell Hall in East Lothian, a Mitchell Hill in Dumfries & Galloway and the Scottish Borders, Mitchellhill in Aberdeenshire and Mitchellslacks in Dumfries & Galloway, but place names based on Mitchell are even more numerous throughout England, including Mitchell itself in Cornwall. The name Mitchell is found frequently enough in Scotland, however, for there to be a family tartan - seen here. Whether or not the name of this suburb can be regarded as Scottish would depend on the ethnic background of the Mitchell concerned. "One urban legend suggests that Mitchell's Plain was named after a farmer who owned the land. The City Council''s version is that it commemorates Major Charles Cornwallis Michell who was the first surveyor-general at the Cape." (AllAfrica.com: http://allafrica.com/stories/200411020731.html). Lieutenant-Colonel Michell was born in Exeter, in the English county of Devon. Montague Gardens - there is a place called Montague in Perth & Kinross but Montague is also found in East Sussex, England. The suburb probably took its name from Montague Road. Considering that most of the roads in the suburb have English names, it is probable that Montague refers to an English nobleman or settler. There is no evidence to suggest that the name could be a reference to the House of Montague in Shakespeare's Romeo and Juliet, or a miss-spelling of the name of one of the Cape's colonial secretaries, John Montagu (an Englishman born in India). Newlands (Aberdeenshire, Angus, City of Glasgow, Dumfries & Galloway, East and South Ayrshire, East Dunbartonshire, East Lothian, Highland, Moray, Perth & Kinross, and Scottish Borders) also found throughout England. The picture here is of Newlands in Glasgow. The Cape Town suburb's name is a translation of the Dutch 'Nieuweland', one of the oldest European place names in South Africa. Porter Reform Estate - there is a Porterstown in both Aberdeenshire and Dumfries & Galloway, Porterfield in Renfrewshire, Porterhall in South Lanarkshire and Porterside in West Lothian. Places with Porter as part of the name are found even more commonly throughout England. The Cape Town suburb has an Irish rather than a Scottish connection since it was named after the Porter Reformatory, the name of which, in turn, was a tribute to Sir William Porter (1805-1880), Attorney General of the Cape Colonial government from 1839 to 1865, who was born in Limavady, Northern Ireland (McCracken, 1993 and City of Cape Town website). Given that Sir William's father was a Presbyterian minister, it is quite possible that his cultural heritage was Ulster Scots. Southfield (Aberdeenshire, Scottish Borders, Dumfries & Galloway, Falkirk, Fife, Midlothian, Orkney Islands, Perth & Kinross and Stirling) also commonly found in England and in at least one Welsh county. An article on the history of Plumstead provides a possible clue to the origin of the name of the Cape Town suburb: "Dr Wood, an Eye Specialist, lived in a big house called Southfield and Mrs Wood started Jersey Creamery - cows grazed down as far as Prince George's Drive." (http://ancestry24.com/history-of-plumstead/). This could suggest that the suburb of Southfield, which is located to the south-east of Plumstead, takes its name from Dr Wood's residence. Strand (Shetland Islands and South Lanarkshire; also The Strand in Argyll & Bute and Strandhead in South Ayrshire) but the name occurs even more commonly in England, including The Strand in central London. The origin of the name of this False Bay resort is most probably Cape Dutch, "strand" being the Dutch and Afrikaans (as well as the Old English) word for a 'beach'. The original name of this community was 'Somerset Strand', i.e. 'the beach at Somerset (West)'. Thornton (Angus, East Lothian, Fife, Midlothian, Moray, Perth & Kinross and South Lanarkshire; also Thornton Burn in East Lothian, Thornton Hill in Perth & Kinross, Thornton Wood in Fife, Thorntonhall in South Lanarkshire and Thorntonloch in East Lothian). Thornton is used far more commonly as a place name in England and is also found in Ireland and Wales. It is possible that since all the streets in Thornton are named after trees or flowers, the suburb's name might be purely descriptive, though a reference either to places in Britain or to a person bearing the surname Thornton cannot be ruled out. Victoria Park (City of Glasgow) also all over England. The Somerset West suburb was named no doubt in honour of Queen Victoria, as was Victoria Park in Glasgow, pictured here. Watsonia Park - Watson is a common family name in both Scotland and England. The suburb of Watsonia Park in the Brackenfell area most probably recalls the watsonia plant, a genus of iris native to South Africa and which was named after Sir William Watson, an 18th Century botanist who was born and died in London. Everglen, Glen Ive, Glen Lily, Oakglen and Sunset Glen also have a mild "Scottish ring" to them, but have not yet been established as Scottish in origin. These are probably made-up names, the word 'glen' (from the Gaelic gleann) having become a descriptive term for a valley that is now used quite commonly in Standard English. Cape Maclear (a promontory at the tip of the Cape Peninsula, near the Cape of Good Hope). Named after Sir Thomas Maclear, the Royal Astronomer at Cape Colony during the 19th Century. Dalebrook (a water feature on the False Bay coast, in the suburb of Kalk Bay) - "Said to take its name from the Dale River in the Shetland Islands, Scotland." (Raper, 2004). Duncan Dock (one of the principal docks at Cape Town Harbour constructed in the early 1940s). Named in honour of Sir Patrick Duncan (1870-1943), South African politician, who was born in Scotland and who served as Governor-General of the Union of South Africa from 1937 to 1943 (Wikipedia article on Patrick Duncan (Governor-General), retrieved in January 2010). Finlay's Point (a promontory south of Simonstown on False Bay). Glen Beach (the northern end of the beach at Camps Bay). Hely-Hutchinson Reservoir (a reservoir behind Table Mountain). Presumably named after Sir Walter F. Hely-Hutchinson (1849-1913), Governor of the Cape Colony from 1901 to 1910. Kelvin Grove Sports Club (a prestigious sports club and grounds in Newlands, founded in 1925). The sports club takes its name from John Brodie's homestead (built in 1881) called Kelvin Grove after Kelvinside in his native Glasgow ( Kelvin Grove Club ). The picture here is of Kelvinside church in Glasgow. Logie's Rock and Logie's Bay (a rock and bay north of Llandudno on the Cape Peninsula). Mackellar's Bay (a bay near Cape Point on False Bay, also known as Buffelsbaai). Maclear Beach (the narrow beach at the Cape of Good Hope). Presumably named for Sir Thomas Maclear (see Cape Maclear and Maclear's Beacon). Maclear's Beacon (the highest point on Table Mountain). Table Mountain's highest point at Maclear's Beacon is 1,086 metres (3,563 feet) above sea level. This point is named for a stone cairn that was built there in 1865 by Sir Thomas Maclear who conducted a trigonometrical survey of Table Mountain. Minto Hill (hillock on Robben Island on which a lighthouse is situated). Murray's Bay (a bay on Robben Island, the island on which Nelson Mandela was imprisoned). According to Raper (1989), this bay was named after John Murray who had a whaling-station there from 1806 to 1820. John Murray was born in Aberdeen in 1749 and was one of several enterprising Scots merchants who established themselves at the Cape soon after it had become a British colony (MacKenzie, 2007, p. 38). Sturrock Graving Dock (dry dock at Cape Town Harbour, opened in 1945). Named after F. Claud Sturrock (1882-1958), Minister for Transport between 1939 and 1948. Although Maclear and Hutchinson are both Scottish family names, the individuals after whom the topographical features were named were in fact Irishmen. Sir Thomas Maclear was born in County Tyrone, Northern Ireland in 1794 while Sir Walter Hely-Hutchinson was the son of the 4th Earl of Donoughmore, an Irish peer. The origins of these place names are therefore more properly 'Scots-Irish' than Scottish as such, i.e., names associated with Northern Ireland as a result of the Scottish Presbyterian plantations of the 17th Century. The Scottish influence on place names in Cape Town, whilst certainly evident, is not as marked as in many Australian and Canadian cities. This is mainly because of the preponderance of names that are of Dutch or Afrikaans origin, followed by names from England and an increasing number of Xhosa names. Cape Town's history goes back to 1652 when the Dutch East India Company established a small colony, under the command of Jan van Riebeeck, to provide fresh meat, vegetables and water for crew travelling between Europe and what is today Indonesia. Because of its strategic importance during the Napoleonic wars to British interests in the East, the Cape became a British colony from 1806. It remained a Crown Colony until the creation of the Union of South Africa in 1910. Scottish influences on the development of South Africa's second most important city occurred mainly, but not exclusively, during the 19th and early 20th Centuries. 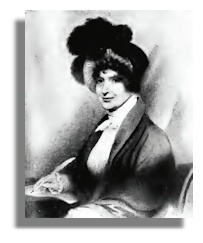 One of the earliest British residents in Cape Town was a Scotswoman, Lady Anne Barnard (1750-1825), the eldest daughter of the fifth Earl of Balcarres and wife of the Colonial Secretary at the Cape. It is thanks to her letters that much is known about daily life during the first British Occupation of the Cape from 1795 to 1803. The picture of Lady Anne Barnard is via Wikimedia. Laidler, P.W. (1952). A Tavern of the Ocean. (Maskew Miller Limited, Cape Town). MacKenzie, John M., with Nigel R. Dalziel (2007). The Scots in South Africa: Ethnicity, Identity, Gender and Race, 1772-1914. (Manchester University Press, Manchester). McCracken, J.L. (1993). New Light at the Cape of Good Hope: William Porter, the Father of Cape Liberalism. Ulster Historical Foundation. Picard, Hymen (1977). Cape Epic. (Khenty Press (Pty) Ltd, Howick, Natal). Raper, P.E. (1989). Dictionary of Southern African Place Names (Second Edition). (Jonathan Ball Publishers, Johannesburg). Raper, P.E. (2004). New Dictionary of South African Place Names. (Jonathan Ball Publishers, Johannesburg). James McFarlane, South Africa, freelance journalist and amateur historian, for information on the suburb of Bishopscourt. Cape Town Street Plan, 2000 (MapStudio, Johannesburg). City of Cape Town official website. Google Maps for the names and location of new and outlying suburbs. Reader's Digest Atlas of Southern Africa (1984). (The Reader's Digest Association South Africa (Pty) Ltd).